The plan had worked. 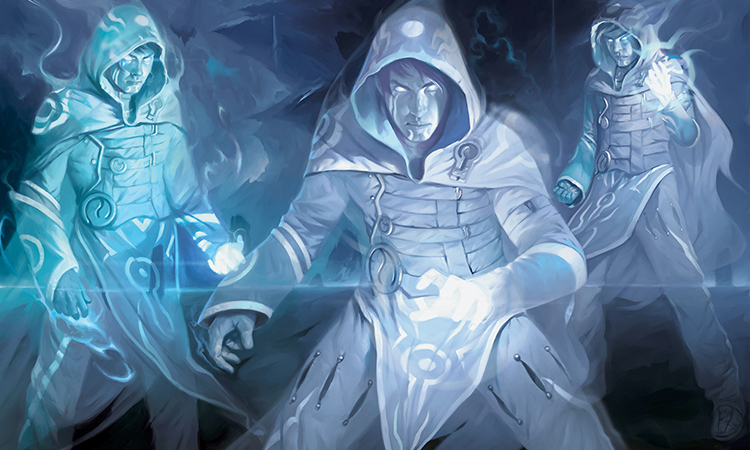 Together, Nissa, Jace, Gideon, and the army of Zendikari had succeeded in constructing an enormous hedron prison capable of holding an Eldrazi titan. And as of just a moment ago, Nissa had heaved the last hedron into place, trapping Ulamog, the monster that had ravaged her world. Standing on the floating rock next to Gideon, Nissa was at eye level with Ulamog's massive, bony faceplate. The impossibility of what they had just done threatened to send her off balance, but the cheers from the Zendikari below buoyed her up. For too long, her world had been at Ulamog's disposal, careening down an inescapable path toward destruction—Bala Ged, Sejiri. But now, finally and almost inconceivably, it was the other way around. At last, it was Zendikar's turn to do the destroying. And Zendikar would show no mercy. "All right, let's start to pull back! Hold your lines!" 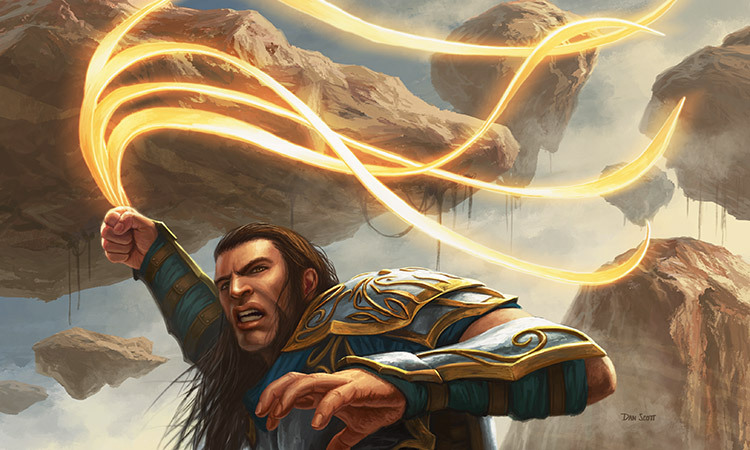 Gideon called orders to the Zendikari below as he made his way down a rope ladder toward Sea Gate. "Keep the perimeter secure!" It was good that Gideon was in charge; the people would be safe with him at the helm, which meant Nissa was free to focus on the titan. A surge of anticipation rushed through her. She looked across the battlefield to Jace. As he met her gaze, he opened his mind to her. He's trapped like you wanted, she said. Now it's time to destroy him. Yes. How many more hedrons were out there buried in the bluff? Jace asked. Nissa could sense the excitement in his voice, even in her head. We're going to need another one, no, two actually. Nissa, this is going to work! I have a plan. So do I. Nissa drew her sword. But before she could make her advance, Jace pushed her attention toward the hedron ring. He had recreated his superimposed, life-size illusionary diagram. With just two more hedrons to redirect the power we're channeling, I believe we'll be able to destroy the titan without ever having to touch it. The risk is minimal—relatively speaking. If we just...Jace continued talking, but Nissa ceased listening. She didn't want a calculated, clinical strike. She wanted to drive her sword into Ulamog's neck. She wanted to eviscerate him. She wanted to end him, right here and right now. She had promised Jace she would not attempt to destroy the titan until he was trapped; now he was trapped. She turned to face the land, looking to the rocky bluff, and she reached out for the soul of the world. She called, and Ashaya answered. The elemental rose with a determination Nissa had not yet seen in the world. With a hope that she had never before felt. Zendikar emerged ready, finally, for freedom. Then something broke. Like a twig snapping underfoot, Ashaya cracked and faltered, pieces of her form crumbling away. Confused, Nissa reached out further, pulling harder. But Ashaya did not respond; her branches convulsed and quavered, and with her, all of Zendikar trembled. The floating rock Nissa was standing on swayed, slowly at first and then faster, violently. Nissa stumbled, thrusting her arms out for balance. 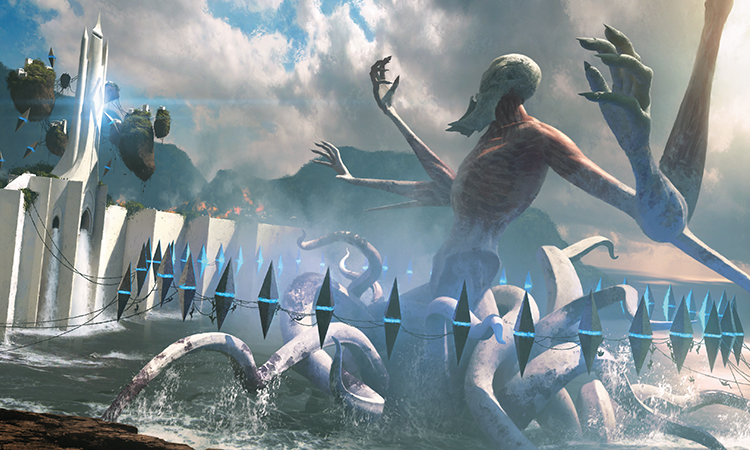 The bucking and quaking was so severe that it felt as though Zendikar was going to tear itself asunder. Then, just as quickly as the quaking had begun, it stopped. The world calmed, and everything was quiet. A ragged gnashing blasted the silence apart. To Nissa's right, the seawall and everything on it swelled like a tidal wave. Nissa watched in horror as Zendikari and Eldrazi alike were sent flailing into the air and came crashing down on the hard stone wall, only to be thrown back up again as the whole thing reared a second time. Wide-eyed and wild, Nissa turned back to Ashaya. 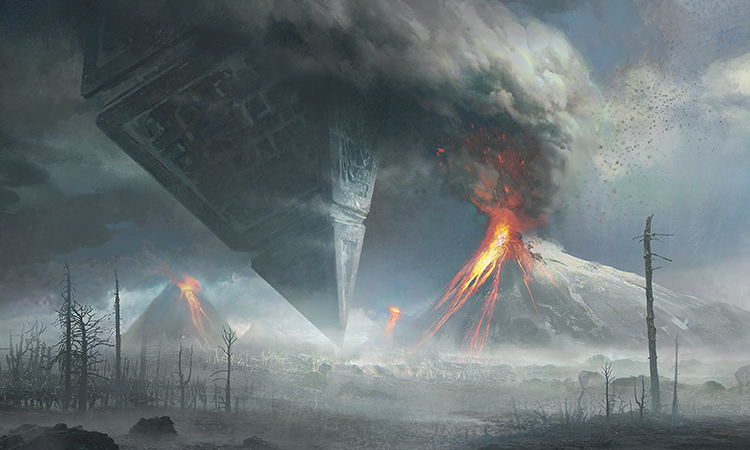 Zendikar radiated a flood of pain and terror as the elemental crumbled into a pile of rubble. "Ashaya!" Nissa ran for her friend, but was thrown to her knees as yet another undulation heaved through the world. Out over the sea to her left, the ring of hedrons rocked as violently as the land. The leylines strained to maintain their formation as surge upon surge of rippling tremors tore across the bay. The prison was going to come undone. But it was not the rocking of the world that was putting strain on it. It was the other way around. The unsettled prison was putting a strain on the world. There, above the prison, Nissa saw a stray hedron, a dark power blasting through it, destroying the integrity of the leyline alignment. It was wrong. It shouldn't have been there. Where had it come from? Anxious, she searched out Jace. Nissa, get out of there! Jace's cry filled her mind as soon as he had her attention. With a great, echoing crack, one of the leylines of the prison snapped. The circle was broken. Nissa's heart stopped. But Nissa didn't run. She launched herself out toward the broken leyline. This couldn't happen. Not now. It was Zendikar's turn. As she landed on a floating rock near the breach, one of the half-freed hedrons tipped, straining its remaining connection until that connection, too, was shattered. For a breath, the great rock teetered, suspended on the last hint of the magical bond that had held it in place, and then it plummeted toward the sea. Nissa was drenched by the massive splash that followed the hedron's impact, but she didn't pause to so much as wipe her eyes. This couldn't happen. She reached out to the dangling leyline, the one that had been connected to the fallen hedron, and she pushed her feeling down into the powerful mana the leyline was made of until she could touch it. The moment she succeeded, an unbelievable surge of power rushed into her. She felt stronger than she had ever felt before. But that wasn't important. What was important was where she channeled that power. She would send it through herself and into the other dangling leyline; she would complete the broken circle using her own body. She would fix this. She was knocked off her feet. Nissa only saw the thick, pink tentacle after it had struck her. Ulamog. With the integrity of the prison compromised, he had been free to breach its border. The hedrons of the ring began to sway, off balance. The leylines were whipped out of her reach. Ulamog would not be contained any longer. No! Nissa jumped up, springing for the nearest vine, this time with her sword in hand. She set her sights on the titan. This couldn't happen. Trapped or not, she would destroy Ulamog. This was Zendikar's turn. 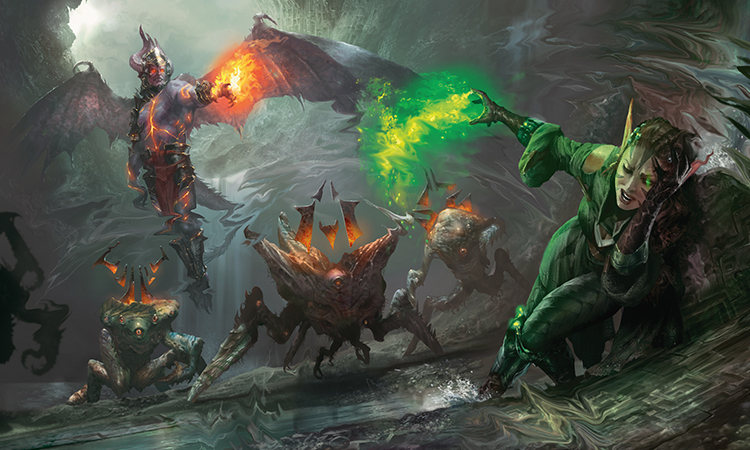 Swinging from a vine, Nissa brought her sword down on one of Ulamog's flailing tentacles. Her blade didn't so much as leave a scratch, but she didn't care. She struck again. And again. And then the rest of the ring gave way. One by one, the other hedrons plummeted into the sea. Wave after wave of salty seawater splashed up at Nissa as a cacophony of terror-laden screams sounded from behind. Ulamog, free of his bonds, was moving toward Sea Gate once more. Nissa cried out in anguish. As impossible as their initial success in trapping Ulamog had been, this end seemed all the more unthinkable. With that thought, a wave of weakness washed through Nissa, draining her. It was all she could do to force her fingers to hold on to the vine. Nissa, what are you doing? You have to get out of there! Jace's voice in her head again. He was as desperate as she had ever heard him, but she couldn't bring herself to move. Now! Jace cried. His anxiety didn't affect her. She stared at the water crashing below. It would be cold if she fell. The prison is broken, Nissa, Jace's voice was quieter. The demon broke it. There's nothing more to do. Just get out. Please. The demon...Nissa shook herself. The demon? All at once she felt him, felt the evil of the monster he was. He was here. She looked up. There he was. The demon she had faced back on Bala Ged, the one who had uprooted Khalni Heart, the one who had tried to destroy Zendikar. He had come back. Suddenly it all made sense. His was the darkness she had sensed, he was the thing that had been wrong. It was his hedron that had upset the prison, that had made the land quake. He was the cause of all of this. And now he was casting a spell, a spell so ancient and powerful that Nissa didn't recognize anything more than its vague shape and its complete and consuming darkness. With the casting of this spell, all the land of Zendikar cried out in pain. Nissa turned to see a row of impossibly large, glistening black shards tearing through the ground. Even before the rest of the monster so much as breached the surface, Nissa knew she was looking upon a second titan. 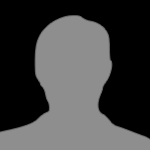 Kozilek. The demon had called yet another horror to ravage her world. She looked back up at the demon, and he smiled down at her. Smiled. 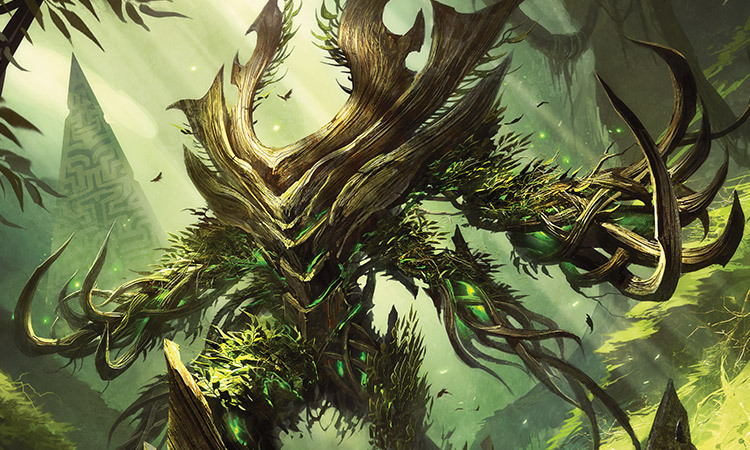 Nissa shuddered, sickened, and in that moment something inside her was uprooted. Some part of her that she recognized from long ago, a piece of herself that she had tried to temper, had tried to forget. There was power in that part of her, and now it was that power that was coursing through her veins. It was not unlike the sensation of the power of the leylines surging through her, but this time she could keep it all for herself. That felt good. Her strength returned tenfold, and she climbed the vine hand over hand, pulling herself up onto the top of the floating rock above. She stood there staring at the demon. She knew that she should turn away from him. She knew that she should flee—or battle the titans, or help the people, or do anything but what she was about to do. But if she did any of those other things, would it matter? Would her actions make a difference? Was there any hope left, any last shred of hope left to save Zendikar? If she turned away from the demon, Nissa would have to answer that question. So she did not turn away from the demon. Instead, she looked straight at him, the eyeblight that had stolen her world's last chance to survive. For that, and for everything else, she would end him. She leapt down onto the thrashing seawall and raced toward the demon, her blade poised, ready to strike. It had been her mistake not to ensure that she had ended him when last they met; she would not make the same mistake again. 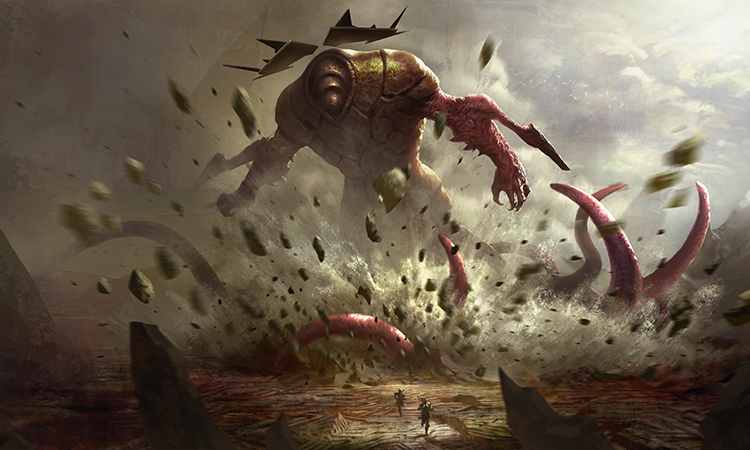 As Kozilek rose, the seawall convulsed, the sea swelled, the land shook, and the Zendikari screamed. But that was all happening around Nissa, outside of her sphere of focus, beyond the rage that drove her forward. The only thing could see was the horrid demon, and the only thing she knew was that he was going to die. 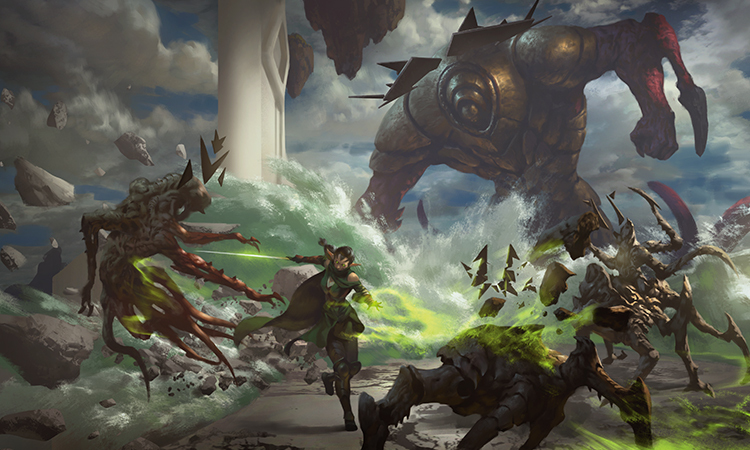 As she fought her way past surging spawn and buckling rock toward the winged monster, Nissa was vaguely aware of the influence Kozilek was having on the world around her. She had felt this titan's influence before, back when more of his spawn populated the world. She hadn't much cared for the warping chaos then, and she was not fond of the muddled, snarled effects he was having on the leylines now. The seamless patterns that should have blanketed the world were disrupted and broken. Everything was amiss. Each step she took required a concerted effort to force her foot to contact the land, to overcome the dissection of reality, to compensate for the gravitational distortions. But she pressed forward. Nothing would stop her. And then the land in front of her erupted. Kozilek's flailing arm had smashed into the seawall, his enormous fist crashing through the rock, sending the lighthouse toppling. The impact launched Nissa into the air, along with shrapnel from the seawall and hundreds of other Zendikari. The world was turned on its head as Nissa hung there, momentarily suspended. Time slowed, and black, iridescent corruption crystallized on the shards of pure white rock and the faces of the people around her. It was as though she was trapped in a frozen pond, suffocated by the press of ice around her. Then suddenly time started again and gravity doubled or perhaps even tripled, pulling Nissa back down onto the crumbling wall with such a force that the wind was knocked out of her. She tried to stand, but it felt like she was sinking in quicksand. Everything around her was turning into jagged edges and geometric patterns that spoke of things unnatural. She blinked, but she couldn't clear her vision. It all looked the same; she could no longer distinguish between the wall, the sea, and the demon. She had fallen into Kozilek's field of distortion. She staggered, unsure of where her next step would take her, unsure of where she was or where she was going. Unsure of whether she was even still alive. Had the end come already? No. No! It was not the end. It could not be. Not until she had destroyed him. The demon was a blemish on her perfect world. The need to remove him from Zendikar drove her forward. She pushed on, putting one foot in front of the other, breathing one breath after the next, until finally she broke free of the reach of the distortion. Liberated, Nissa raced to the end of the white rock of the seawall and out onto the cliff, straight at the demon. She dove for him, tackling him to the ground, her blade at his neck. "Good for you." He looked up at her, still smiling that revolting smile. "Finally willing to win. Finally willing to do what it takes." "You!" Bile rose in the back of Nissa's throat as she plunged her blade downward. But with one swift movement the demon skirted her sword and dislodged himself, flying up and away, at the same time sending a tide of his essence-draining magic down at Nissa. It struck her before she could get to her feet, sucking the life up out of her veins, drinking in the hatred that was fueling her. She cried out, reaching for the land, and sent a cascade of earth up toward the demon. But it never touched him; the land pivoted in the air and shot back down at her, following an unnaturally knotted and twisted bundle of leylines. Nissa rolled away, tumbling across the ground as the rubble rained on her—black and twisted detritus, unnatural and tormented. Panicked, she watched as four spawn of Kozilek's lineage skittered in between her and the demon. Had he called them? "Alas," the demon said, "my plans must take priority. Zendikar falls." He gave a slight nod, and the spawn closed in on Nissa, driving chunks of rock up around her. "And Zendikar will die." Searing pain tore through Nissa, and she bellowed in agony. Though she hadn't meant for it to, her cry alerted Ashaya. She could feel Zendikar's concern for her as the land around her began to rise up; the world was coming to her aid. But even as it did, it was being warped, broken, and corrupted. It was being ruined. No. Nissa could not allow it. She pushed Zendikar's soul away. Away from this distortion, away from this blight, away from her. Get back! Ashaya didn't want to go. The world refused leave her, but Nissa forced it away. There was nothing more either of them could do. 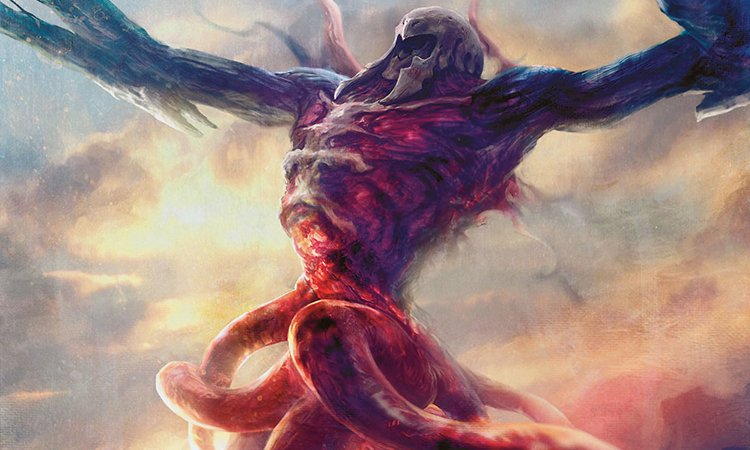 As she let go, she felt her last shred of hope contort into fear under the influence of Kozilek's spawn. Her gut wrenched. The earth, the leylines, the life of the world became so contorted and twisted that they no longer existed. As the demon laughed, the last of Nissa's reality unraveled. I laughed at the elf's confused expression, her reality unraveling before her. I couldn't help it. It was funny. Something about the eyes. "Oh, little elf. Would you like to hear something amusing? If you had simply let me finish my work, I would have regained my spark and left your world. I didn't choose you as an enemy, but now I feel obliged to be the enemy you deserve. 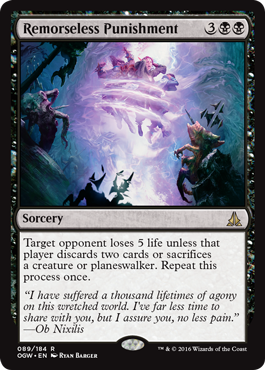 Kozilek's distortion will allow you to experience the last hours of Zendikar drawn out over the space of a thousand years. Suffering as I did. Normally I don't care for these kinds of theatrics, but you've earned yourself an exception." Kozilek's spawn encircled the Joraga, slicing space in such a way that no leyline could reach her, like spiders weaving a web of broken reality. She was cut off from Zendikar. Powerless. My mind strained to direct the spawn. It was possible, but I knew I was walking the blade's edge. Especially with the titan this close, I risked madness or worse. But as long as I didn't command them to do anything the titan directly opposed, I didn't think it would mind that I was borrowing a few spawn to take care of an insect that was meddling with its work. I leapt back into the sky to survey the rest of the field. It had become a rout. Glorious. Now it was time to leave this place and never return. After I had ensured that no survivors escaped Sea Gate, of course, I would leave this place and never return. Actually, that wasn't important right now. I should just leave this place and never return. Interesting. Someone was in my head. Unacceptable. Telepaths are the absolute worst. I've had far too much experience with people trying to put things in my head that don't belong there. I had a vague directional sense pointing me toward the intruder, hidden among the fleeing soldiers below. I hurtled to the ground like a comet and blasted away the Zendikari on impact with the muddy, brine-soaked ground. A blue-robed boy stood tall, unhurt but startled; he reflexively split into dozens of mirror images. Not a bad trick. I whispered a word: the truest name for pain that I had ever learned. In a crackling sphere around me, agony reigned. I felt it as much as he, but I was less of a stranger to pain than this boy. All of the images doubled over, but only one of them actually felt it. It was trivial to pick out the genuine article. I smirked as I lunged for him but shuddered as he met my gaze. Those eyes hit me like a lance. Discarding subtlety, he assaulted my senses as hard as he could, but that just meant my fist broke his cheekbone instead of taking his head off as I'd intended. He spun to the ground, crumpling into a heap of mud-splattered robes. I stepped forward to snap his neck and be done with it. Something gripped my wing from behind and tossed me back away from him, shredding the wing in the process. I landed painfully and looked up to see my foe. Though he could have followed up with a second blow before I saw it coming, he had waited. Tall, thick, square-jawed, and determined. A good-looking fellow by most standards. I chuckled as I sized him up. He was willing to strike me from behind to save his friend but wasn't willing to win a fight that way. I liked him immediately. A hero. I inclined my head to him slightly. "Ob Nixilis. A pleasure. Now, I would ask you to kindly step aside and walk home. You have the look of a general about you, so you must know this war is lost. Was the defense here your doing? Very impressive. I'd love a rematch some time. You pick the world and the terms. But for now..."
He interrupted me with a slash from his metal...quadruple...whip thing. Was he actually wielding a sural? Hadn't seen one of those in centuries, and never on Zendikar. Sural specialists tended to be extremely skilled, or entertainingly short-lived. I sidestepped the attack, annoyed. "These people are under my protection, demon. Stand down, or I will take you down." He really sounded like he meant it, too. "Disappointing. Back in my day, if you'll pardon the expression, there was a certain civility to all this. But I guess Planeswalkers aren't what they used to be. For one, they die a lot easier." I raised my palm and let loose a sustained torrent of pure enervation. And this fellow just stood there with a vexing smirk on his face and a golden glow surrounding his body. Invulnerability! This was shaping up to be more interesting than I had expected. "Not that easy," he quipped, and he charged, slashing at me in wide arcs. He charged hard but didn't overcommit on distance—he had a reach advantage, and he wasn't giving me an opening to close to a grapple. I kept him at bay with more blasts of energy; most he evaded, but a few struck home. Each time he managed to brace himself with that golden glow of his. Tactical consideration: his protection required him to focus. He had a fluid expertise with it, though. He was flawlessly weaving the shield into his series of attacks, giving me no real openings. More than once, I caught slashes on my forearms, but the wounds were superficial and healed rapidly. He kept me in a defensive posture, and he didn't bite on any of my feints. We fought back to a neutral position; he had managed to maneuver himself between me and the telepath again. "You fight well, but you can't hurt me, and I won't let you harm any more of these people. 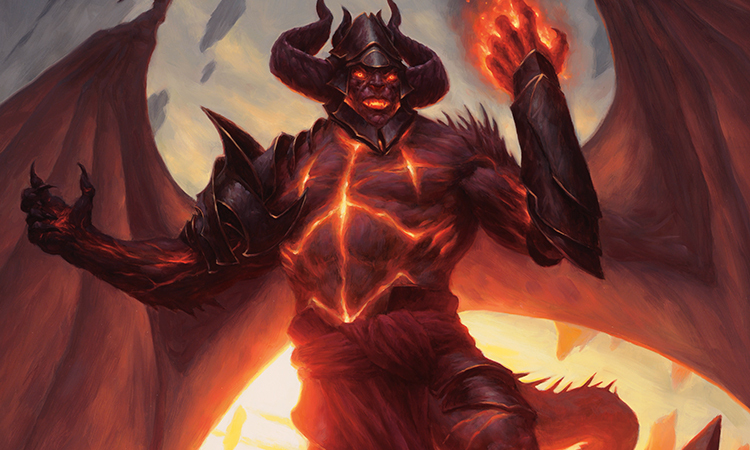 I fight for Zendikar, demon." There was plenty of determination in his voice, but I could see the beginnings of doubt edging its way around his face. That's how it always begins. "Nixilis." I corrected. "And you mean...these people?" I casually flicked a beam of energy into a huddle of stragglers and wounded. Six dead. He flinched as if to press the attack again, but he wouldn't leave his position defending the telepath. "Or do you mean him? Oh, my friend. The telepath has gotten to you, hasn't he? This is why you always kill the telepaths first. How sure are you that you're protecting him of your own free will? How sure are you that he hasn't done a little work in that head of yours?" His eyes flicked off to the side—back to the telepath—just for a moment. That brief instant was all it took for doubt to open the crack a little wider. And in that tiny moment in time, I was charging forward, and for that tiny fraction of a second, his weight was on his back foot. There are moments like this in battle, where time stands still. Where the joy of combat overwhelms the senses and the passage of time. He lashed out at me as he dropped into a wrestler's stance, but the strike was high and wide. When our eyes met, I could see that look of joy in his face as well. He loved the fight just as much as I did. Good. I wouldn't have it any other way. He dropped low to meet my charge, but I was ready for it; he tried to sweep my leg, but, with a single beat of my undamaged wing, I vaulted over him and slashed at him with a clawed hand. His shield deflected the blow, but the impact pushed him a foot farther from me than he wanted to be, and he closed with an explosive charge. I had time to brace for it and settle into a low stance. I had the superior weight and strength, but he was quicker, with a lower center of gravity. I didn't know his exact fighting style, but I was familiar enough with the general type to anticipate what was coming next. I gave him a target and he took it. He locked his legs against my knee and started to press—a perfectly executed takedown and joint lock. I was heavier than he was, but he'd still be able to break the knee in just a few seconds. I used those seconds to get control of his right arm, locking it back behind my neck as we grappled close. We splashed in the mud, blood, brine, ichor, and worse, struggling for control—and he was the better wrestler. The knee cracked and a sickening jolt pulsed through my body. The problem for him, however, was that he was expecting that to be the end of the fight, while, in fact, having my knee broken was merely the third worst sensation I had experienced in the last hour. I used my one good leg and my superior weight to pin him. He gritted his teeth, face splattered with the same mud that covered me, that covered all of us, that covered this miserable, doomed world. He channeled his focus to keep his shoulder from breaking. But I had him. I had him and he knew it. "You fight for Zendikar? For this broken dung-heap of a world? Well, see how it rewards you!" I pressed his face down hard into the muddy water. He thrashed and flailed, he sputtered and coughed, struggling to get purchase. I could feel the despair and fear as his hands slipped in the mud. As he batted uselessly at me. As he started to drown. Invulnerability proved no match for three inches of dirty water. "This is Zendikar! The suffering and the waste and the filth! This is Zendikar!" He convulsed once more, and his body went limp. I held him there for a second more before I released my grip and flipped him onto his back with a splash. "This is Zendikar," I whispered. "And your fight is over."